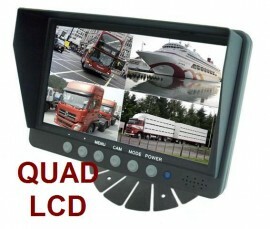 The QUAD LCD Monitor Can Work With Up To FOUR AUTO SWITCHING COLOR Cameras. Select from Our Many Other Addtional Rear View Backup/Side View Cameras! For the Rear View Backup System Combo Package (Multiple Rear View Cameras and LCD Monitor), contact us to get FREE CABLES and HUGE DISCOUNT!!! System Accessories include: Universal Adjustable Monitor Mounting Bracket, Optional Windshield Suction Mount, Video & Audio Input & Control Cable, and Main Power Cable. Notes: See the Accessories Pictures below!